Are you looking to make more money with your book? If so, you need the right strategies to get you there. 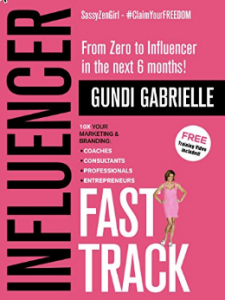 Listen as marketing superstar, Gundi Gabrielle shares her special techniques to ensure you make your books profitable. Gundi Gabrielle, also known as the SassyZenGirl, loves to explain complex matters in an easy-to-understand, fun way. (I love that. Just my kind of person). She’s a 10-time number one bestselling author, entrepreneur, and former Carnegie Hall conductor. Gundi employs marketing chops from all walks of life and loves to help her readers achieve their dreams in a practical, fun way. Her students have published multiple number one bestselling, outranking the likes of Tim Ferriss, John Grisham, and Liz Gilbert. She is an expert at turning books into even more profit-generating businesses. When she’s not writing books, she’s enjoying a cat on her lap (or both). She’s passionate about exploring the world as a digital nomad. One awesome adventure at a time. How to keep your book selling, for months and even years. The secret of the Evergreen Bestseller Hack. What you need to build a strong brand that people recognize. What Google and Amazon are much stricter about now. Where to find people who are eager to review your book. Why OPA is so extraordinarily powerful. Here’s how to contact Gundi to learn more about her products. Download Gundi’s free webinar here.